After the January meeting of the Porter Co. FIST Team, Director Jim Branham asked all personnel to cast their vote for the member of the team that in their opinion had contributed the most over the past 12 months. After all votes were tabulated, Deputy Director John Kepshire was again announced as the winner of the Investigator of the Year. John has been with the team since it's formation in 1997, and has served as the team's Deputy Director since 1999. This is the third time that he has been honored by his peers for his outstanding commitment to the team. John is a member of the Porter Township Fire Dept., as well as being a career firefighter/paramedic with the South Haven Fire Dept. CONGRATULATIONS JOHN!! On February 4, 2000 FIST received a grant from Chubb Insurance Group as a token of their appreciation for the work done in determining the origin and cause of a fire that destroyed a mansion in the Town of Ogden Dunes. Due to the donation FIST was able to purchase a 5,000 watt portable generator, 4 500 portable quartz lights and a trash pump. The members of FIST would like to thank the Chubb Insurance Group for their most generous help and support!! On December 30, fire destroyed the Evergreen Furniture Warehouse on U.S. Hwy. 20 in the Coolsprings Township area of LaPorte County. Early on it was decided that due to the massive size of the structure additional help would be needed to properly determine the origin and cause of the blaze. When the call for the FIST Team was received, four Investigators and two Technicians, along with the Mobile Investigation Unit were dispatched to assist the LaPorte County personnel conduction the investigation. 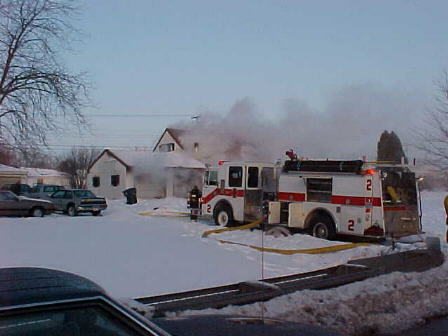 Smoke pours from an attached garage on State Road 149 on February 3, 2000 as South Haven Engine #2712 prepares to make an interior attack. An aggressive interior attack knocks the fire down within minutes as mutual aid companies from Liberty Twp. and Union arrive on the scene.